Without a strong web presence, businesses may find it difficult to compete. 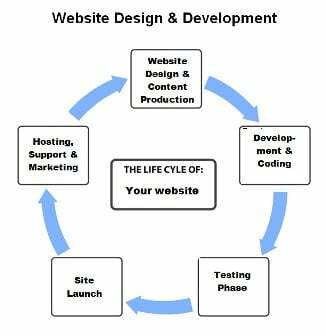 Once considered a static on-line brochure, web design and development is a totally different product. Today’s websites are dynamic that help adapt to a changing business environment and changing technologies. They communicate your band and develop prospects and leads through an interactive website. Once we have created a beautiful, functional website design for your business, we will help you get noticed on the search engines through optimization. It’s that strong web presence that will bring customers to you. We tailor a website that works in harmony with your brand. Every website we develop is unique and highlights your business in the most productive manner. It will be the focal point of your on-line marketing efforts. UNIQUENESS – All of our designs are custom tailored to your individual business objectives. Are you selling a product on-line? Are you trying to gain more close rates on service calls? Whatever your goals are, our team will delve into learning more about your objectives in order to provide the fundamental ingredients to achieve visibility. AESTHETICS – An attractive website is not only pleasing to the eye, but your visitors will remain on your site longer. Incorporating your logo colors, photos and graphics will support your purpose and objectives. VISIBILITY – Getting notice in the search engines is essential for any website. We’ll help you improve the visibility of your website in search engines through organic (non-advertised) means for optimal results. MARKETING CAMPAIGNS – Our Marketing Team will meet with new website users to improve visibility through a variety of different campaigns. These campaigns get a great return and coincide with your on-site presence. The marketing campaign will be designed to fit precisely with your company’s objectives. You will meet with our web designers one-on-one to begin the design process. We will get to know you, the owner and ask pertinent questions to learn more about your company goals. Through a series of communications, we will develop clear objectives for great website content. We offer turnkey business advice. We can assist you with obtaining domain names, logo design or redesign, branding and marketing. Together we can consult with you on the best strategy so your business will succeed. Because when you are successful, we are successful.